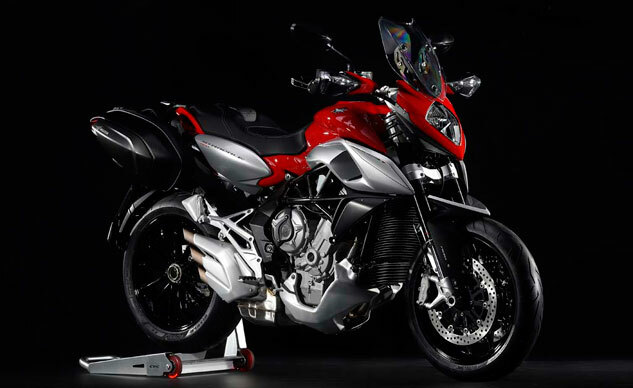 Looking to tap into the lightweight touring segment, MV Agusta unveiled the Stradale 800 this week at EICMA. Resembling the sporty and athletic Rivale, the Stradale 800 takes that platform and modifies it for a slightly more touring-oriented ride. For starters, the Stradale gets a mini windscreen that MV says is adjustable with just one hand. If you’ve ever ridden the Rivale, you’ll appreciate how important the addition of a windscreen, even a small one like this, really is. From there, seat height is reduced 10mm to 870mm, or 34.2 inches. It’s still quite tall, but the narrow seat/fuel tank juncture should help riders touch the ground easier. Front and rear suspension units offer 5.9 inches of travel and are fully adjustable. Combined with the 30mm longer wheelbase, measuring 57.4 inches (1460mm), and subsequently longer single-sided swingarm, the Stradale has the ingredients for a stable ride in the twisty stuff. At least compared to the twitchy Rivale. If you remember from our previous test of the Rivale, fuel capacity and range were serious limiting factors. MV has addressed this by adding four liters extra capacity (1 gallon), for a total of 16 liters (4.2 gallons). While still on the smaller side for a touring rig, the additional tank space certainly is a welcome addition. Then of course the most obvious change to the Stradale over the Rivale is the saddlebags on each side, which integrate the turn indicators. 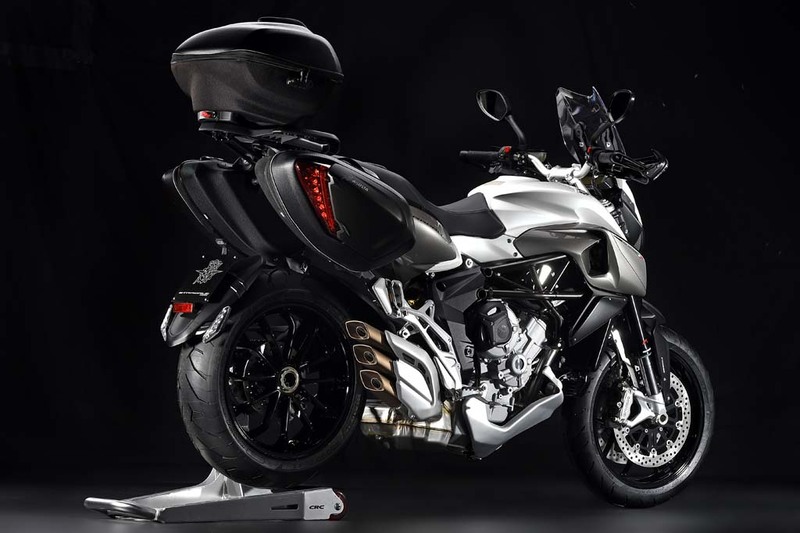 Otherwise, the Stradale and Rivale are virtually identical: from the steel trellis frame with aluminum side plates, to the 798cc inline-Triple with counter-rotating crankshaft to minimize inertia during side-to-side transitions. The Electronic MVICS suite is back, which includes four different power modes, ABS with rear wheel lift mitigation and quickshifter, for full-throttle clutchless upshifts. Color schemes for the new Stradale 800 include: Red/Silver, Pearl White/Aviation Grey, Bronze/Pearl White. U.S. pricing and availability were not available at press time.